It was Saturday, so Frans didn�t have to work. Nan was already gone to the local boat club when Frans proposed to go to the swimming pool. Swimming pool? 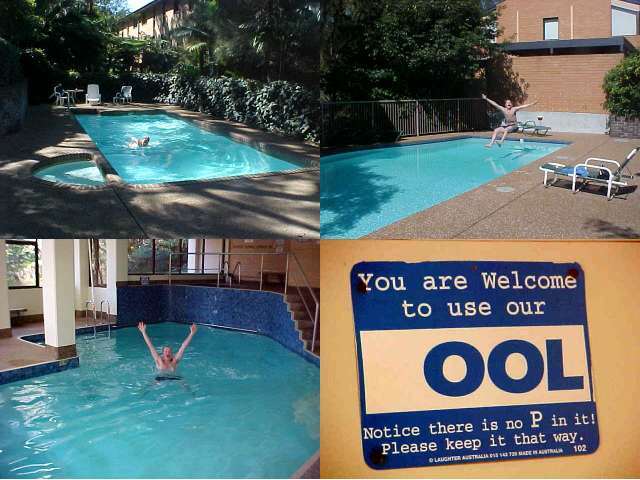 �Yes, we have a few pools around here, for the residents and their guests only.� A few? So we went for a walk with a camera and a few towels and we visited all the pools in the locality for some good morning jumps. And it was very refreshing, together with the walking through the forest. However some 200 apartments are built in this forest-rich area, no destruction of the original nature could be seen. It was all in perfect harmony. In The Netherlands we have these bungalow park resorts with tropical swim paradises called Centre Parcs, and Frans is totally right when he says that he lives in an Australian Centre Parcs. I had a shower after all the swimming and Frans prepared some toasts for breakfast. And breakfast with the Dutch is always fun, because they�ll always have something Dutch like original chocolate sprinkles as a topping � not available anywhere else! Around noon, Nan had come back from her Saturday morning sporting event and they both prepared to go to a formal performance of men-ballet in the Sydney centre. And that was a good coincidence, as I would meet up my next hosts in the city centre too! From northern Lane Cove Frans drove me to [i]Pitt Street[/i], one of the centre streets of Sydney, where I got off and thanked the Dutch couple for their hospitality. I hope everything would work out with their tax deduction and said goodbye. I was standing in front of a [b]HUGE apartment complex and had to press the 3-digit number to get in contact with the owners. They opened the door and told me to get into the elevator and head to the 41st floor. The 41st floor?! And there I woozed up to the top floor and met up with the American couple Kathey and Russell . I shaked their hands while I was shaking on my legs, because I simply couldn�t believe that I would be staying on the 41st floor of an apartment complex in the middle of Sydney. I was simply amazed by the 200 degrees view their studio offered. Kathey took me along to the 8th floor and showed me the swimming pool and the sauna, and the Squash hall, poolroom and fitness gym hall on the 7th. These guys live in a great place! How long can I stay? �Ramon, if you ever want to come back here, maybe when your girlfriend comes around, you are very welcome to stay here again,� Kathey said and made me silent. It was Russell who had invited me somewhere in November last year, after his brother in Texas forwarded an email to him about me. Also Russell never expected me to get to Australia at all, but were happy when I showed up in Oz. Kathey and Russell met each other during their computer studies in the US, as they were both in the same class. They got married and they travelled almost half the world as backpackers (I don�t remember if this was the right order), so they have already seen more than I have done so far. Their map on the wall has those little pins in it, showing where they have been and that was fascinating. And to listen to their stories about Thailand (not suitable for vegetarians) and Venice (only American tourists) was very interesting. Russell and Kathey are both computer programmers and recently Kathey got herself a home online job for a foreign company. It sounds funny to be working at home, through the Internet, but it is about finishing certain projects within a certain time. �Of course I can decide anytime if I�d get my nails done outside�, she laughed. I settled in their diningroom with a view on the east part of Sydney (I could see the Pacific Ocean from here!!!) with my laptop to write some chronicles for the Dutch press, and I can assure you that a view like this was to a certain extent stimulating for every word I typed. Kathey and Russell decided to go for a drink at Paddy Maguires Pub down George Street and we both enjoyed a pint of black Guinness beer (one of my favourites!). Two Australian friends of my hosts joined the terrace table and we got company by two devilish Guinness converters. 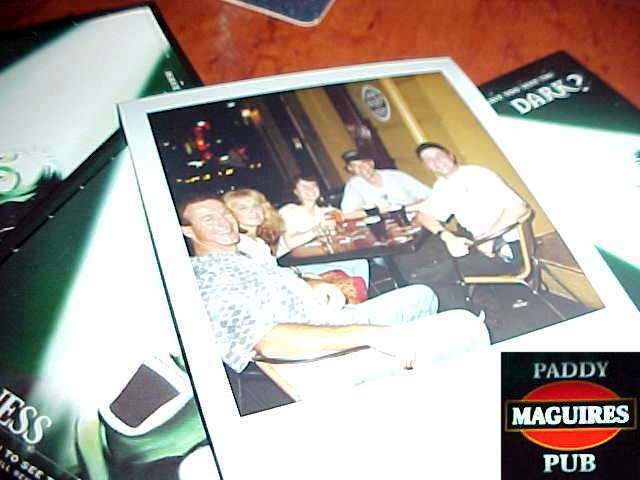 As there wasn�t much to convert on me, Russell and me got a Guinness bucket head and had our photo taken on Polaroid. When the two ladies heard about my project, one of them was going almost mad. �Jeez! You get to see the whole world for free?� They were actually standing at our table that long that the manager of the pub ordered them to get moving again. After a few beers the group decided to go into Chinatown and eat at a Vietnamese restaurant. Of course I started the topic on the United States and the Americans as the image of the states and its citizens isn�t that positive in certain parts of the world. But this Aussie friend of my hosts made it all very clear. And I think he�s partly right there. After a long night of talking I reminded this saying: �A traveller never thinks he is the foreigner�, and I totally support that too. After dinner at the restaurant, we all got back to the 41st floor apartment and watched Sydney by night from the high-rise balcony. 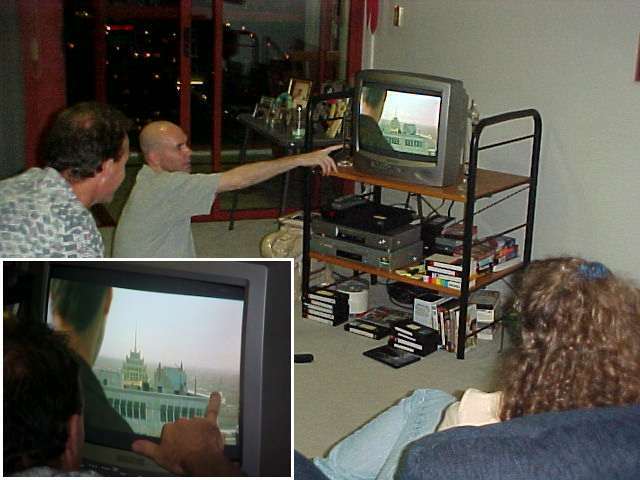 Russell pointed out that he was still trying to find out on which skyscraper the movie The Matrix was filmed. He took the DVD with it on television and we looked out if we could see the specific buildings as on TV, but we couldn�t really find it. It was probably somewhere else in the city or on the other side of their skyscraper.